New Delhi: India’s wholesale prices rose more than expected, according to figures released less than a week before the central bank is due to decide whether to raise interest rates to prevent a flare-up in inflation. The benchmark Wholesale Price Index climbed 1.21% in the week to 10 October from a year earlier, after gaining 0.92% in the previous week, the commerce ministry said on Thursday. Economists expected a 1.1% increase. “Subbarao is faced with a complicated job," said Dharmakirti Joshi, an economist at Mumbai-based Crisil Ltd, the local unit of Standard and Poor’s. “There is consensus that the days of easy monetary policy are gone but I think the central bank will tilt towards supporting growth next week." RBI reduced interest rates six times between October 2008 and April 2009 to record lows to shield the economy from the worst global recession since the 1930s. In its last policy statement on 28 July, it left the reverse repurchase rate unchanged at 3.25% and kept the repurchase rate at 4.75%. “The stance of monetary policy will have to change from its highly accommodative position," the economic advisory council, headed by former central bank chief C. Rangarajan, said on Wednesday. The council said India’s economy may expand 6.5% in the year through March 2010, slower than the 8.7% average growth of the previous four years. The $1.2 trillion economy grew 6.7% last fiscal year. India’s wholesale prices have risen for six straight weeks after declining for three months. Consumer price inflation is also running above 10%. Consumer prices paid by farm workers rose 13.19% in September from a year earlier and those paid by industrial workers climbed 11.72% in August. Food prices are rising as weak monsoon rains hurt farm output, causing shortages. “Inflationary pressures on the food front will continue to be a major problem for policy formulation for the rest of the current fiscal year," the advisory council said in Wednesday’s report. To minimize divergences between various gauges of prices, the government announced on 19 October that it plans to release its wholesale inflation number on a monthly rather than weekly basis, moving toward the practice of most other economies around the world. India’s Wholesale Price Index published on Thursday may be revised in two months, after the government receives additional data. 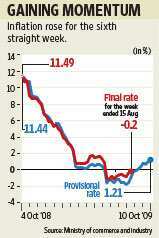 The ministry revised the rate for the week ended 15 August to a drop of 0.2% from a decline of 0.95%.